Congratulations Joe! - Access Mail Processing Services Inc.
Congratulations to Joe Noodwang of Access Mail!! Joe has been with Access Mail for 20 years. He has held a variety of positions and is currently a Certified Mail Design Professional, Customer Service and Data Analysis expert. Joe can often times be found at our customer’s offices helping customers that are having issues with their mail meter settings. 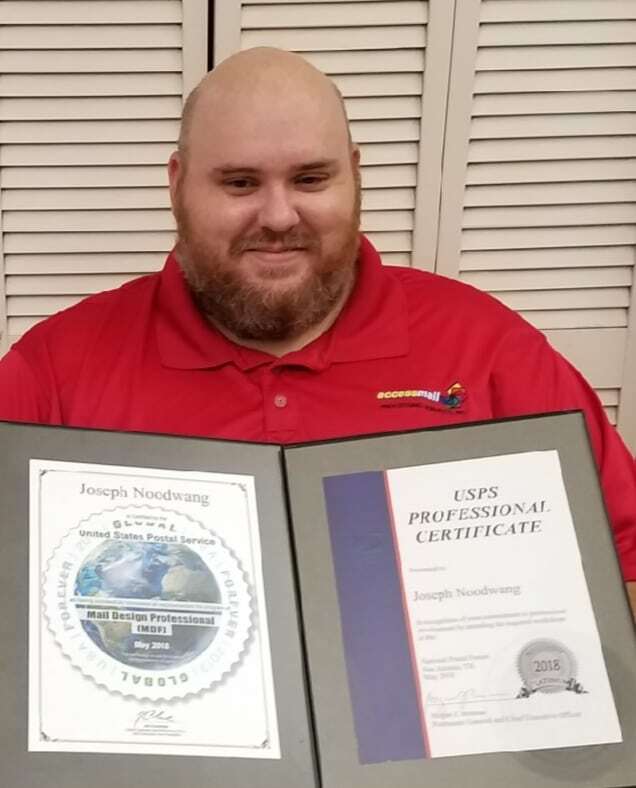 Joe most recently achieved Certification from the United States Postal Service as a “USPS Professional”. This Certification was signed by the Postmaster General Chief Executive Officer, Megan J. Brennan. Last May Joe attended the National Postal Conference in San Antonio, TX for a week of continuing education and activities.